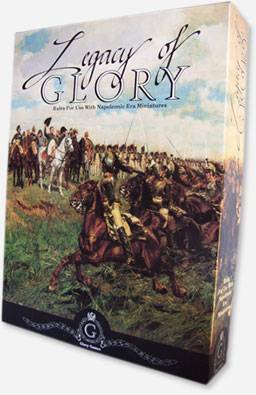 Legacy of Glory was the first �perspective� based miniatures rules that limited command control and reflected the dramatic chaos of a Napoleonic battle � not a game where an army commander worries about moving an artillery battery a quarter inch. Legacy of Glory presents rules to simulate battlefield management of an army, wing, or corps � you experience the same challenges faced by the historical commanders: time, distance, fatigue, incompetence, smoke and confusion. One figure averages 60 men. Ground scale for 15mm soldiers is 1� = 50 meters. The smallest units on the board are infantry battalions, cavalry regiments, and artillery batteries. Play is in 2-hour Grand Battle Turns (GBT), subdivided into six tactical turns. Players receive a variable number of command points each GBT, determined by the talent rating of the historical general they are representing and the roll of two 10-sided dice. Commanders issue orders to the units under them, down to division (or to an elite brigade) � each order requires a different number of command points. Once an order is issued, there is some delay before it can be executed, depending on distance, quality of the generals, and roll of 10-sided dice.